Here at The Magic Apple we strive to sell only the highest quality magic and magic supplies. We will try to bring you all the best magic has to offer. Our ultimate goal is to advance the art of magic. We carry more products and have more suppliers than any other magic shop or webstore in the world! Sometimes, items in the shop are not always online and vice versa. Although we try and carry everything that is listed in this site, we are sometimes out of stock on some products. Not sure if we have it? Give us a call 818-508-9921. 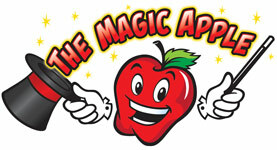 Please note that The Magic Apple is not affiliated with any other magic shop or online store. Really, we are the only ones the matter! Drop it like it's hot.